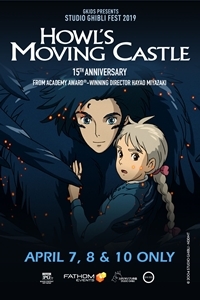 Description To celebrate its 15th anniversary, Fathom Events and GKIDS bring Howl's Moving Castle back to movie theaters as the first title in Studio Ghibli Fest 2019. Sophie finds her life thrown into turmoil when she is swept off her feet by a handsome, mysterious wizard named Howl. The vain and vengeful Witch of the Waste, jealous of their friendship, puts a curse on Sophie and turns her into a 90-year-old woman. On a quest to break the spell, Sophie climbs aboard Howl's magnificent moving castle and into a new life of wonder and adventure. As the true power of Howl's wizardry is revealed, Sophie finds herself fighting to protect them both from a dangerous war of sorcery that threatens their world.